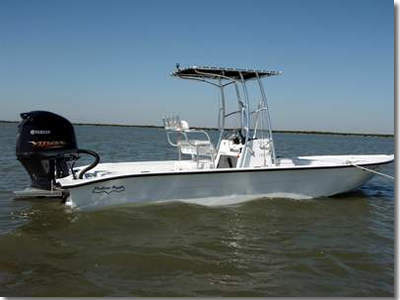 as well as the Espiritu Santo Bay, West Matagorda Bay San Antonio Bay. A happy customer in Port O'Connor! Prepare to go wade or drift fishing with artificials,bait or fly. Capt. 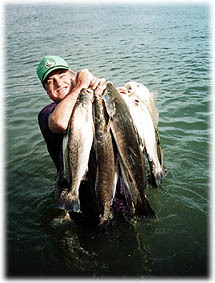 Lynn Smith,a full-time professional fishing guide. Owner of Back Bay Guide Service. Port O'Connor Chapter and member of the Shallow Sport Pro Staff! You can also fish the Matagorda Island Surf. Tackle is provided if necessary, and all fish are cleaned and bagged for you! 250-HP Four Stroke Yamaha VMAX Outboard Motor! Capt. Lynn's 16-foot Airgator airboat, with it's 350cid V8 Engine! Corporate and Multi-boat Trips are Welcome! "4% Processing Fee Will Be Applied To All Credit Card Transactions." Anglers have visited Captain Lynn's web site! Copyright © Texas Saltwater Fishing.com 1997/ 2018 All Rights Reserved.